How people fulfills its desire to listen to music has changed many times over since humans first banged two bones and discover rhythms. In the last 20 years however the industry has seen massive changes, at a pace never seen before, these changes driven by a booming technology sector and its effects on consumers’ behavior and expectations. 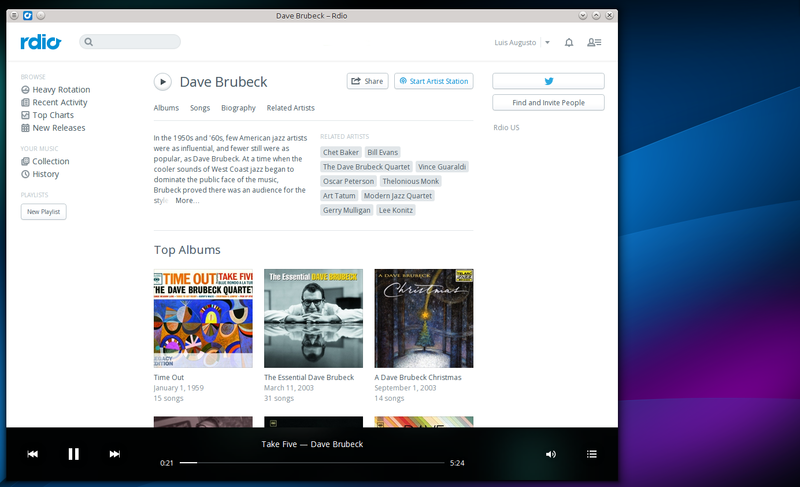 When I started using Linux one of the big things people talked about was how amazing Amarok was, and even though I didn’t decide to install Linux because of Amarok it certainly affected my opinion in a positive manner, the idea of improving my listening experience was really attractive. Amarok 1.1 automatically checked for changes in your library, fetched album arts, lyrics, metadata and recommended similar music, it was an improvement over the simple experience of clicking play on Windows Media Player or iTunes. But this advantage didn’t last long, Apple had launched the iTunes Store a few years before Amarok 1.1, an experiment set to combat the explosion of piracy that was being pushed by the convenience of getting any music you wanted when you wanted, anywhere, enabled by P2P and faster download speeds. This new innovation took a long time to come to our lands, and the specific store that started all is not, and will never be, available on our platform, it was from the hand of the cloud that stores got into Linux, via Amazon for example. Granted: the open source community had a few ideas of its own, inspired by copyleft, things like Jamendo or Magnatune, but they’re not in the same league, people demand popular music. Instead of walking into a physical store, buying a CD, going home, inserting it and finally importing the music to your local hard drive a new paradigm emerged: You could just open your favorite music application (or web store) and buy almost any song. This automatically meant people could choose to buy only what they wanted as opposed to buying a whole album when they only cared about a single song. As I said this revolution took a longer time to get to Linux than any of us would’ve liked it to, if I recall correctly the Banshee Music Player had a plugin to access Apple’s iTunes Store as a ‘hacky’ workaround. Linux was stuck for a long time in a world before digital stores. At the core this is not that different from how we used to consume music in the 80’s, you still had to buy a copy, and you had limited rights to make copies of your copy, the only thing that was changed was the place you acquired your copies. This is the current version of Amarok, times have changed and Amarok’s heavy insistence on displaying album arts in every possible spot as well as contextual information no longer seem innovative, nor is searching for album arts, or metadata or recommending similar songs, and more importantly, they don’t seem that well presented (this well become evident soon). Ironically, while we were fighting to catch up (e.g. Ubuntu’s Music Store) the music industry moved even further away, into yet another model, a model which ensures they increase per capita anual expenditures from it customers at the same time they make piracy inconvenient. Entirely abandoning the idea of you buying the right to use copies, the new model is all about buying access to a catalog, you subscribe to a service and as long as you’re paying you can listen all the music you want without ads, and for a certain price, you can use it on your mobile devices and save songs for offline playing. A big part of this new model is the “freemium”, listening to music on your P.C. with ads is completely free. Discouraging what labels felt was a potential killer threat, namely piracy, was probably the biggest incentive for them to push this kind of service, instead of finding a shady site just pay us something each month and you can listen to pretty much anything you want instantly, make it available for offline listening if you wish to, will recommend you music you probably will like, you can follow artists and friends, and listen to on-demand radio, skip songs as much as you wish, etc. Of course, if companies manage to get big numbers of customer on board they will be essentially increasing by an exponential amount their current revenue, as it’s undoubtedly the case that most people do not spend $10 USD a month on CDs or songs from iTunes. At the beginning of this truly digital revolution, commanded by Spotify, you were expected to install an application to stream music. 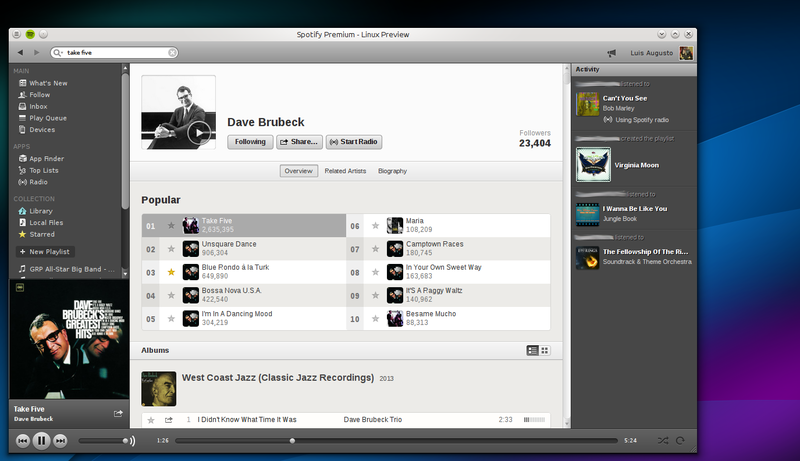 Unlike what happened with Apple’s iTunes Store, Spotify worked just fine on Linux almost since launch with the help of Wine, a practice endorsed by the company itself (although not officially supported, in other words not guaranteed to work), and soon enough Spotify Beta for Linux was announced. But this wasn’t enough. Having to install an application to stream music from the cloud was a still an unnecessary barrier, and at the end of the day, Linux is still not supported by Spotify (as they clearly point out). Thankfully, in the context of healthy competition surely soon enough someone would ditch that idea of having to install a program, and that someone was Rdio (although they do offer desktop apps that nobody uses). 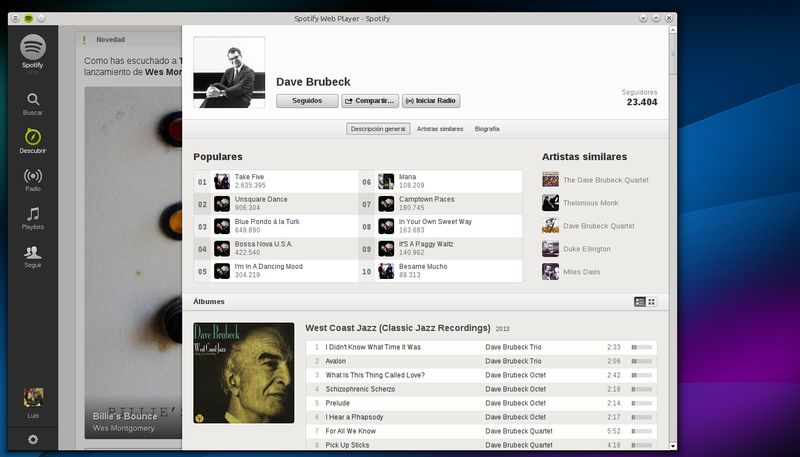 Soon every music streaming service, new or old, was adopting the model of web apps. Deezer (which is to my knowledge the one with the widest worldwide availability), the legally doubtful Grooveshark, Rara.com, MOG, Google Music and even Spotify are all now available with nothing else but a decent web browser. Quite behind modern services and web applications. Google’s cloud storage system, Music, was recently extended with an appropriately named service called “All Access” that works like Spotify or Rdio. However, availability is for now limited to the United States. But none of this matters, because web applications work just as well in Linux as they do on Windows or Mac OS X. Linux went, without making any effort, from trying to catch up with the big guys to being on par with them simply because the cloud is taking over, this is an incredibly positive development: as the cloud gains power it reduces the ability of Microsoft to engage on anti-competitive practices and it reduces to negligibility the costs of also supporting Linux . Sometimes the open source community can distrust the idea of the cloud, people like Stallman certainly do, but perhaps there’s no other thing that has helped Linux as much to catch up (where is still needed) as the cloud. And it’s a joy, unlike what happens in some other industries, to get access to the latest services the same day Windows users do, despite all of Microsoft’s past efforts to stop this from happening. Wow- really interesting. 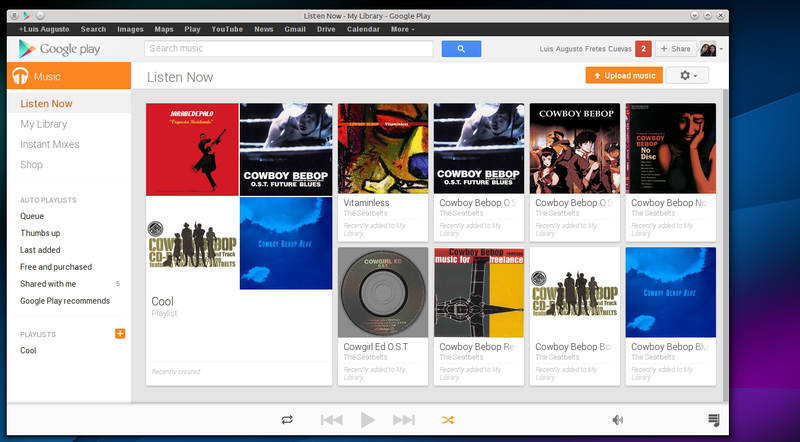 I like music players that are very simple and don’t require many resources. But that’s what’s great about Linux- so many choices! For Android- my favorite player is just the open-source basic player; it does everything I want and nothing else- perfect!